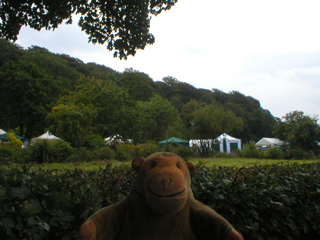 One morning when Mr Monkey was buying bananas in Romiley he saw some small posters announcing that the 15th Chadkirk Festival was going to be held on the 30th and 31st of July. He thought he'd go along to see what was going on. 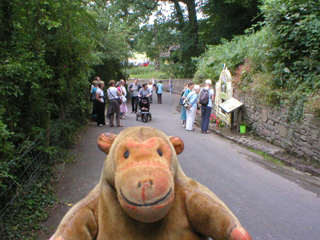 Mr Monkey trotted through Romiley and down the hill towards Chadkirk. Soon he was going down the rather steep hill and could see people looking at St Chad's Well, which had been specially dressed for the occassion. Well dressing is either a pagan tradition from the Celts or a form of thanksgiving that started in Derbyshire in 1349 (or possibly a pagan tradition that was supressed and then restarted in 1349); however it started it seems to have mostly died out by the 1930s and then been revived in the 1950s. 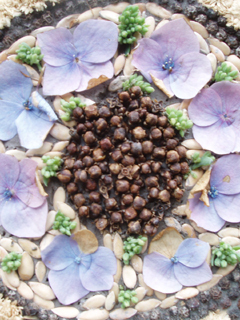 It involves using a variety of natural materials to create a picture surrounding a well or spring. 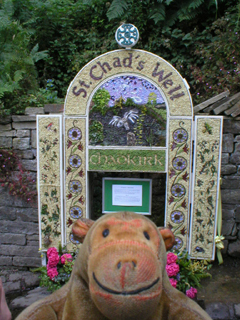 St Chad's Well is more of a spring next to a hole in a wall than anything else, so the welldressing pretty much obscured the well itself. 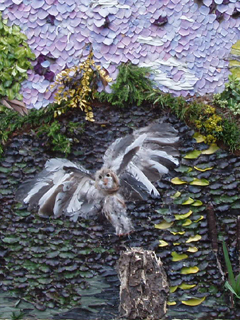 Mr Monkey was impressed by the work that had been put into the Chadkirk Welldressing, but he did wonder why the creators had chosen to put an unsettling owl into the main picture. There was a note which probably explained the design and who had done the work, but Mr Monkey couldn't read it without getting in everyone else's way, and it didn't seem polite as so many people were interested in the dressing. After he'd looked at the dressed well, Mr Monkey trotted a little further down the hill towards Chadkirk Chapel. He was unreasonably surprised to find that the field, the walled garden and the churchyard beside the Chapel were all full of stalls of different kinds, almost as if there was a festival in progress. 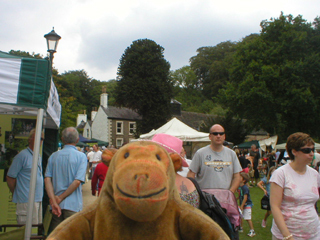 Mr Monkey let his humans pay the entrance fee, then wandered around the festival site. Visiting the various stalls, Mr Monkey bought some dried bananas (to divert Mr Rik from his real bananas), a block of beeswax and some books about the history of Stockport. He examined stalls manned by the National Trust, the Stockport Heritage Trust and the Mellor Archeological Trust, but was very careful not to get too close to the owls and hawks perching in the SMJ Falconry enclosure. You can't be too careful with owls. While he was wandering around Mr Monkey listened to singing by the Liberty Belles, saw magic by Captain Id of Splott from the wrong angle, and heard part of a demonstration by Circle of Life yoga. Mr Monkey had to be restrained from playing in the entries for the miniature garden competition, and left before anyone demonstrated flying wild birds. The only thing Mr Monkey couldn't do was look at the chapel properly, because there were so many people inside or around it, so he decided he'd come back on another weekend to tour the Chadkirk Chapel and Estate properly.